March 31, 2015 - Officials do not believe Germanwings copilot Andreas Lubitz who brought down Flight 9525 over the French Alps did it as a terror act but that he suffered from depression. Germanwings today reported its parent company insurance company has set aside $300M for compensation costs. On March 24th Germanwings Airlines a low-cost German airline owned by Lufthansa, Flight 4U 9525 from Barcelona to Dusseldorf crashed into the mountains over the French Alps killing all 150 onboard. The German Federal Bureau of Aircraft Accident Investigation and the French Bureau of Aircraft Accident Investigation teams have retrieved the Airbus A320 *Black Boxes and based on audio taken from the voice recorder, the French authorities have come to the conclusion that after the aircraft had reached cruising altitude, the captain left the cockpit for a short time and was then unable to re-enter. It also appears that the co-pilot, 27-year-old Andreas Lubitz who had stayed in the cockpit, prevented the captain from re-entering by fully locking the cockpit door in order to then initiate the fatal descent that killed all 144 passengers and six crew members onboard Flight 4U 9525. Capt. Patrick Sondenheimer could be herd on the Black Box pleading with the co-pilot, banging on the cockpit door "For God's sake, open the door!" The Black Box has one and half hours of voice. Before takeoff the captain indicated to Lubitz that at some point he would need to use the rest room. At about 10:27 AM the aircraft reaches its cruising altitude of 38,000 feet. The captain informs the copilot to prepare the landing. After the check, the copilot states to the captain "You can go now." There is the sound of a seat moving backward. After that, the captain is heard saying, "You can take over." At 10:29 AM, air traffic radar detects that the plane is beginning to descend. At 10:32 AM, air traffic controllers contact the plane and receive no answer. Almost at the same time, an alarm goes off in the cockpit saying "sink rate." The aircraft began a descent rate of approximately 3,400 feet per minute. Shortly after that there is a loud bang on the door. The pilot can be heard screaming, "For God's sake, open the door!" Passengers can be heard screaming in the background. At 10:35 a.m., loud metallic bangs can be heard as though someone is trying to knock down the door. The plane is at about 23,000 feet. Ninety seconds later, another alarm goes off, "Terrain, pull up!" the plane is at about 16,400 feet. The captain is heard screaming, "Open the damn door!" At 10:38 AM, the plane is descending toward the French Alps, and the co-pilot can be heard breathing. The plane is at about 13,100 feet. At 10:40 AM, it sounds like the plane's right wing scrapes a mountaintop, then screams can be heard one more time. Those are the last sounds on the voice recorder. Officials reported that they have removed a computer and other items from Lubitz's home in Dusseldorf, Germany. Among the items, investigators have reportedly found Antidepressants that belonged to Lubitz. No suicide note was found nor did they find any indication that this act was political or religious. Last week Thabani Nkwanyana, a medical examiner at South African Airways said "We are at big risk, we face an aviation time bomb with the lack of proper psychological assessment and regulations for aircrew." On Friday the Lufthansa Group reported that their group member airlines have adopted “rule of two” for aircraft cockpits. In coordination with the Luftfahrtbundesamt (Germany’s aviation authority), the other German airlines and the German aviation industry association (Bundesverband der deutschen Luftverkehrswirtschaft), the airlines will adopt a new cockpit occupancy procedure as a precautionary measure. Under the new procedure, two authorized persons must be present in the cockpit at all times during a flight. Search teams continue to recover remains from the mountainside where the aircraft went down. Update - April 2, 2015 - Offices reported that Lubitz computer and iPad had been search and their findings indicate that the copilot had search the internet between March 16 to March 23, the day before the crash for ways to commit suicide, and the security measures for cockpit doors. 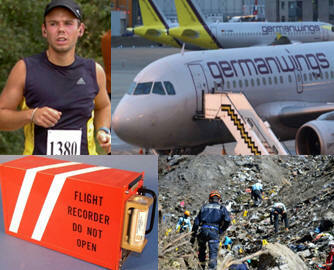 *The "black box" is a generic term for two recording devices carried aboard commercial airliners. The Flight Data Recorder (FDR) records a variety of parameters related to the operation and flight characteristics of the plane. The Cockpit Voice Recorder (CVR) records the voices of the flight crew, engine noise, and any other sounds in the cockpit. All large commercial airliners and certain varieties of smaller commercial, corporate, and private aircraft are required by law to carry one or both of these boxes, which generally cost between $10,000 and $15,000 apiece. The data these devices provide is often invaluable to experts investigating the events leading up to an accident. The recovery of the boxes is one of the highest priorities in any mishap investigation, second only to locating survivors or recovering the remains of victims. FDR information is also often used to study other aviation safety issues, engine performance, and to identify potential maintenance issues.